MindNode is an intuitive and consumer-friendly web-based mind mapping application that permits organizations and teams to visualize their ideas on Mac computers and iOS devices. The software is developed by IdeasOnCanvas, an independent software company based in Austria. MindNode delivers superb and innovative features which allow users to capture, explore, organize, and share ideas. The mind mapping solution can organize ideas in one document which layout can be customized. It also enables users to capture and express their ideas in various forms which include texts, images, tasks, and links. MindNode makes it easy for them to establish connections and relationships between different ideas through the aid of its clean user-interface, allowing them to link and unlink ideas and discover new ideas and connections. When it comes to organizing ideas, MindNode can generate attractive texts and documents, letting users apply their own styling so they can organize and present their ideas neatly and nicely. To visualize how ideas relate to each other and flow throughout a document or page, the application provides users with an outline view feature. With MindNode, they can store all their documents in the cloud or publish them online using MindNode’s servers. They can also import documents into third-party mind mapping solutions and other programs and export them from such applications. The application is built with an auto-sync feature through which documents are automatically synchronized and updated across Mac and iOS devices. Killer and brilliant ideas start from a collection of thoughts that are loosely connected to each other. MindNode helps team gather all these thoughts in one place so they can generate great ideas from them easily. The application provides them with the ability to quickly put their thoughts into a document or page through the aid of its quick entry feature. With this feature, they can type in words and capture all things inside their mind. There are many ways to express thoughts aside from texts or words, and MindNote can actually accommodate all of them. Whether they are words, images, tasks, extended notes, or links; the application supports multiple expressions or forms of thoughts. Users can even drag elements and components from third-party applications and files, and drop them onto MindNode’s user-interface. 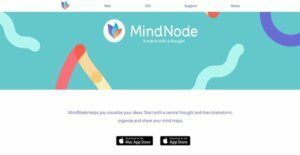 In addition, MindNode ensures that teams are able to concentrate more on capturing their thoughts and generating ideas from them rather than wasting their time thinking about how such thoughts and ideas should be presented. It has a layout feature that they can take advantage of to make sure that their documents where their thoughts and ideas are placed are readable and attractive. With MindNode, users can set up connections and relationships between their thoughts. This way, they will be able to come up with ideas that are logically related to each other. It has a plus feature which permits them to explore new connections and relationships. For instance, they can link two thoughts together, click on the plus sign, and define how the thoughts are related to each other. They can also adjust the connections by removing nodes or adding new ones. MindNode is really a great visual thinking tool because it is designed with a clean user-interface where users can easily develop thoughts and come up with organized ideas. They can start from a single thought and form new thoughts or ideas from it until they are able to produce a complete and fully structured visual representation of the processes or things about their business or organization that they want to define, describe, and explain. The mind mapping application also reflects whatever thoughts, ideas, and connections users have in mind as they create, develop, and modify them. For instance, they can connect a set of nodes to another set and the application will automatically adjust the visual elements associated with those nodes. They can also detach nodes and reconnect them to where they originally belong if they want to. MindNode ensures that users are able to effectively communicate the relationships between their thoughts. This way, they can help their colleagues and stakeholders understand complex information better. The application is built with a document style feature which enables them to access different style options for customizing the texts, nodes, and information contained in the documents they are creating using the application. They can add specific colors, themes, and objects, helping them generate beautiful and comprehensible documents. Another feature present in MindNode is the Outline View. After users are done creating ideas and defining relationships, the application allows them to view outlines of their completed documents. No matter how large the document they are viewing or how complex the processes they are describing, this feature assists them in easily reviewing such document and searching for specific contents within it. This is made possible through the aid of its expand or collapse functionality. Sharing ideas, documents, and projects using MindNode is a breeze. This is because teams can store them in the cloud. They can use their existing iCloud accounts so that they can access and work on their documents from any Mac computer or iOS device. They simply need to connect the device to the Internet and then they can access the documents from iCloud Drive via a web browser. In addition, MindNode has an auto-sync feature. For example, users can start working on a document from their Mac computer and finish it from their iPad or iPhone. Whatever changes they made to the document using their iPad or iPhone will be automatically updated on their Mac computer. Because of this, they can comfortably work from any location, remain productive, and access up-to-date information. MindNode can also be integrated with other tools like FreeMind, OPML, OmniFocus, Things and Markdown. As a result, documents in various formats can be imported to and exported from third-party applications. For instance, if users want to collect data from a particular app and add them to their documents within MindNode, they can export documents from the app where such data are contained. In case, they need to continue working on a document from another app, they can use MindNode’s import feature. If you are interested in MindNode it may also be beneficial to check out other subcategories of Best Mind Mapping Software collected in our database of SaaS software reviews. Each organization has different wants and needs an application that can be customized for their size, kind of employees and buyers, and the specific industry they are in. For these reasons, no platform can offer perfect tools out-of-the-box. When you search a software app, first be sure what you want it for. Read some MindNode reviews and ask yourself do you want basic tools or do you need complex functionality? Are there any industry-specific features that you are searching for? Find the answers to these queries to aid your search. There are lots of factors that you need to mull over and these include your budget, specific business requirements, your organization size, integration requirements etc. Take your time, use a few free trials, and finally choose the app that provides all that you need to boost your organization efficiency and productivity. How Much Does MindNode Cost? MindNode offers a single enterprise pricing plan which you can avail through a one-time license purchase. The app can be purchased and downloaded from Mac App Store and iOS App Store. If you’re going to run the software on a Mac computer, you can buy it a price of $39.99. For iOS device users, the price is $14.99. A free 2-week trial to get a feel for the app. All features can be unlocked for $39.99 on the Mac and $14.99 for iOS devices. Prior MindNode 2 for Mac customers can purchase a discounted MindNode 5 for $14.99. Prior MindNode 4 for iOS customers can purchase a discounted MindNode 5 for $9.99. We realize that when you make a decision to buy Mind Mapping Software it’s important not only to see how experts evaluate it in their reviews, but also to find out if the real people and companies that buy it are actually satisfied with the product. That’s why we’ve created our behavior-based Customer Satisfaction Algorithm™ that gathers customer reviews, comments and MindNode reviews across a wide range of social media sites. The data is then presented in an easy to digest form showing how many people had positive and negative experience with MindNode. With that information at hand you should be equipped to make an informed buying decision that you won’t regret. What are MindNode pricing details? What integrations are available for MindNode? If you need more information about MindNode or you simply have a question let us know what you need and we’ll forward your request directly to the vendor.